Eloisa to Abelard (1717) is a poem by Alexander Pope. 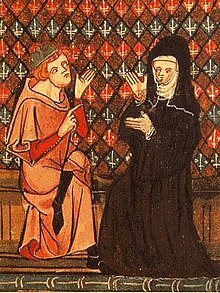 It is an Ovidian heroic epistle inspired by the 12th-century story of Héloïse's illicit love for, and secret marriage to, her teacher Pierre Abélard, perhaps the most popular teacher and philosopher in Paris, and the brutal vengeance that her family exacts when they castrate him, even though the lovers had married. Conceal, disdain,—do all things but forget. Line 185; similar here to "She hugg'd the offender, and forgave the offence", John Dryden, Cymon and Iphigenia, line 367. Lines 361-366; The last line here is probably inspired by that Joseph Addison in The Campaign (1704): "And those that paint them truest praise them most". [It] excelled every composition of the same kind. The mixture of religious hope and resignation gives an elevation and dignity to disappointed love, which images merely natural cannot bestow. The gloom of a convent strikes the imagination with far greater force than the solitude of a grove. This page was last edited on 13 November 2016, at 17:58.